A new on-demand service that combines Sky Box Sets and Netflix launches in November. Ultimate On Demand promises to be the UK’s biggest on demand TV service, bringing together for the first time Sky Box Sets, which boasts 400 of the best UK and US series, and the full Netflix service with its popular range of global entertainment. “We want Sky Q to be the number one destination for TV fans. Partnering with Netflix means we will have all the best TV in one great value pack, making it even easier for you to watch all of your favourite shows." What will "Ultimate On Demand" offer? Sky original productions such as Patrick Melrose, Save Me and Tin Star, and US hits like HBO’s Game of Thrones and Showtime’s Billions, alongside Netflix’s original dramas, films, comedies and documentaries, which include The Crown, Stranger Things and The Kissing Booth. Recommendations for Sky and Netflix shows will share the spotlight on Sky Q’s homepage. Ultimate On Demand will be £10 a month for all new and existing customers alongside their Sky Q subscription. A 31-day rolling contract is available, adding flexibility - although customers do need to be already on an 18 month Sky Q contract for the other aspects of the service they are getting. Which level of Netflix subscription is included? 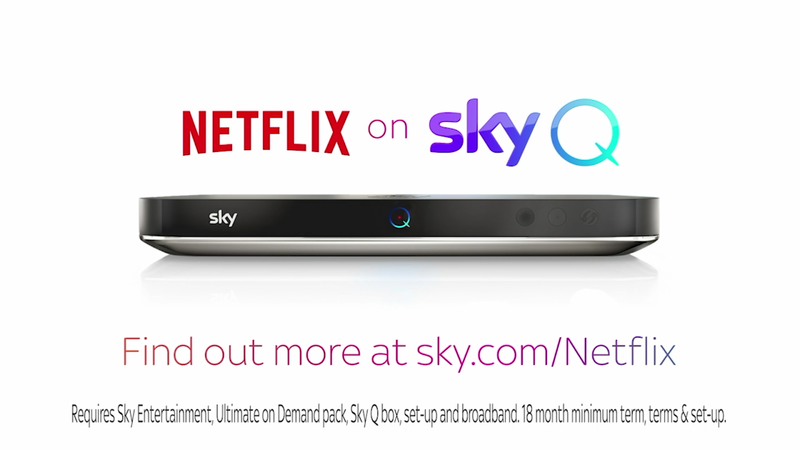 Customers with a Sky Q Entertainment subscription will get Netflix’s Standard plan (HD 2 streams) and Sky Box Sets in HD as part of Ultimate On Demand. Customers with Sky Q’s premium subscription, Sky Q Experience (multi-room viewing and Ultra HD), will enjoy Netflix’s Premium plan (Ultra HD, 4 streams) – that’s more than 2,000 hours of Ultra HD content across Sky and Netflix. What about Sky Q customers who already have a separate Netflix subscription? Sky+HD users will need to switch to Sky Q to get Ultimate On Demand, otherwise they will need to separately pay for Sky and Netflix. Ultimate On Demand will be billed to customer’s monthly Sky bill, so a separate Netflix subscription is no longer needed.